Measurements: 3.5 x 5.4 inches, or 88 x 138 mm. Large. Back of card: Solid black with white edges. In the center a circular "Karma Music Tarot Cards" & in the center of that, half a clown's face with a stick sticking out of his ear. Not for inversion. Booklet included: Yes, 44 pages, 3.2 x 5.2 inches, or 80 x 132 mm. Text by Birgit Boline Erfurt. Comments: A Danish deck. The artist was a resident of Christiania, a self-contained anti-establishment commune in Copenhagen in the late 1970's. Her method of working was to sketch by lamplight in the evenings & paint in bright colors during the day. Many of the cards show her friends. 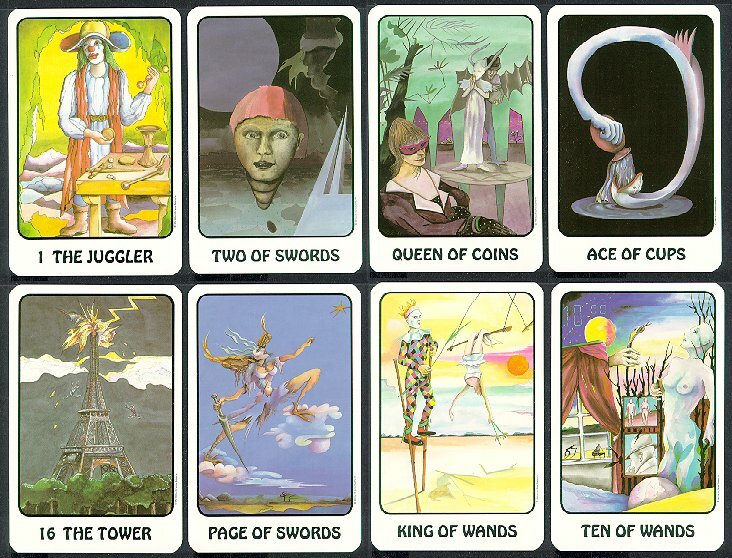 The deck seems influenced by the surreal style of Salvador Dali, who, if my memory serves, was popular at the time. On the bottom row I selected cards that seem particularly Dali-esqe. And the Eiffel Tower. I wondered why she chose the Eiffel Tower. In the book, she says it's a Tower of Materialism & is therefore to be condemned. Gee, when I saw it, it reminded me of electricity in some strange way. Wheels spinning on the sides. I always thought it a wondrous sight, but I'm an American. What do I know? The meanings of these cards, as given in the booklet, are essentially what we're used to. The two extra cards contain an amusingly badly-translated biography of the artist. We'll spare you the gaffes. Karma Music is a multi-track recording studio & publishing office. They publish alternative music, poetry & posters. Among Karma Music's releases are music by Birgit Boline Erfurt & her husband, Tomrerclaus. Heck, I can't resist. Here is Birgit Boline Erfurt on her art, 'Let your eyes see a painting by Birgit Boline Erfurt, let your brain work, and extinct animals will speak to open your mind.' Is it just me, I wonder? The little booklet with the cards is fairly good. It gives reversed meanings, even though the back of the cards is a bit too specific to make an inverted card a surprise. All in all, a nicely done deck.